Australian capitalism’s sheltered workshop, the private health insurance industry, is burning billions of dollars a year unrelated to Australians’ health. Thursday’s latest statistics for the year to the end of March show the industry increased its gross margin to 14.4 per cent, up from 13.6 over the previous corresponding period. Premium revenue rose 4 per cent, to $23.75 billion, while the insurance companies’ benefits payments increased by 3 per cent to $20.1 billion. The resulting health insurance gross margin of $3.65 billion went on expenses of $2.21 billion, tax of $441,000, state ambulance levies of $226,000 and net profits of $1.38 billion. Thus private health insurers spent $3.65 billion on stuff other than the medical needs of their customers. That’s money that didn’t pay for hospitals, doctors, nurses, drugs, prostheses or even the sundry ancillary benefits that are a dubious insurance proposition for customers – dental, physiotherapy, optical and chiropractic. This is an industry that enjoys the federal government acting as its enforcer, pushing customers through its doors, using the cattle prod of tax penalties. It then blows 14.4 per cent of the money customers pay on things other than health care. Some of that money goes on lobbying the government to ensure the perpetuation of two-class health care. The private insurance companies need at least the perception of the public system being second-rate as part of its sale pitch. 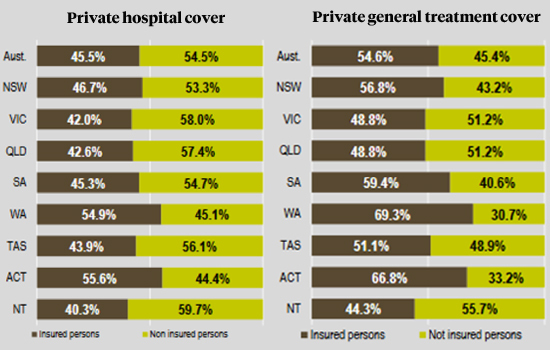 Despite the government’s tax carrots and sticks, most Australians – 54.5 per cent – didn’t have hospital treatment cover on March 31. That’s up from 53.1 per cent five years ago. The general treatment sales effort has been more successful – 54.6 per cent of us buy it, similar to the 54.7 in 2013. The industry’s grand ambition was spelt out last year by the CEO of one of the two ASX-listed insurers, NIB. Mark Fitzgibbon told the AFR he wanted to bring back the days before Medicare. “We need to be thinking about how do we create a future in which 70 per cent of the population have health insurance, as it did before Gough Whitlam introduced Medicare,” he said. Shamelessly propped up by the tax system, the double act of private hospitals and private health insurance push the line that public hospitals couldn’t cope without them, ignoring the inefficiencies of maintaining two systems and what the money spent on private hospitals and insurance could achieve if added to the public hospital budget. Just for a start, there’s that $3.65 billion of health insurance premiums that went nowhere on health in the latest year. Australia’s mishmash of state-run public hospitals and private hospitals effectively funded by federal government policy has inherent inefficiencies, but is something we’ve become used to. It also is a system with massive vested interests that enjoy the power, connections and money to fight to preserve and expand those inefficiencies. Nice piece Michael, and oh so true. Ties in nicely with JM’s piece on the scourge of the lobbyist. Essential planks of the private health insurance spin are (i) they are ‘saving’ the public system and (ii) best to avoid the public system if you possibly can. Sadly, most people have no comprehension that Gough’s original Medibank, beyond its simple egalitarianism, had, like a wondrous tonic, the fact that most of us – including those of us with voices and influence – were in it, so would make bloody sure it was good enough.